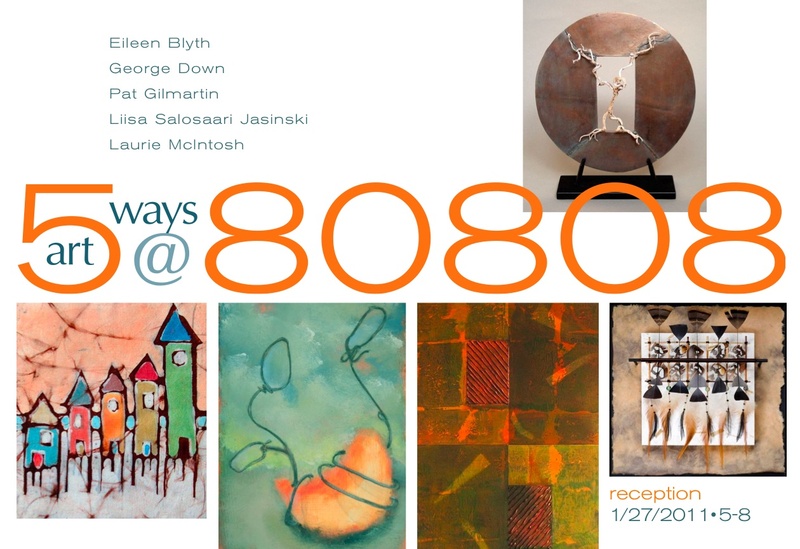 This group show at Gallery 80808 opens with a reception on Thursday, Jan. 27 (5 – 8 p.m.) and closes Tuesday, Feb. 8. The artists, in their own varied and distinctive styles, make for an exciting and vibrant exhibition of paintings, batiks, ceramic sculpture, and assemblages of found objects. 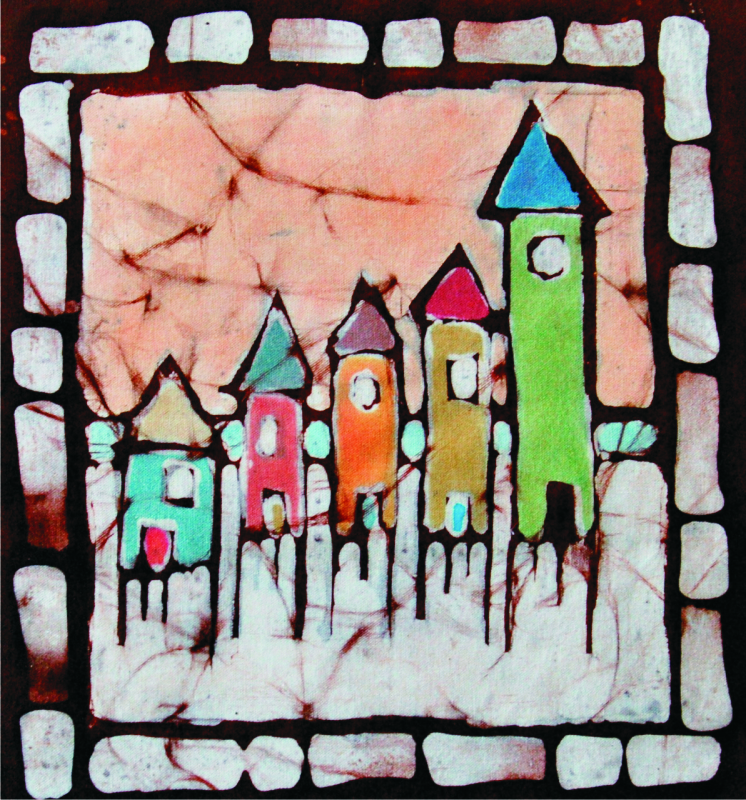 Laurie Mcintosh explores the method of wax-resist dyed fabrics, or batiks, for this show. Inspired during a trip to Africa by the Zimbabwean’s colorful textiles, she has produced a collection of batik images which examine familiar themes but through a new (to her) process for creating linework and color saturation. Although perhaps better known for her oil paintings, Laurie’s batiks represent a continuation of her interest in the culture and creatures of South Carolina’s lowcountry. 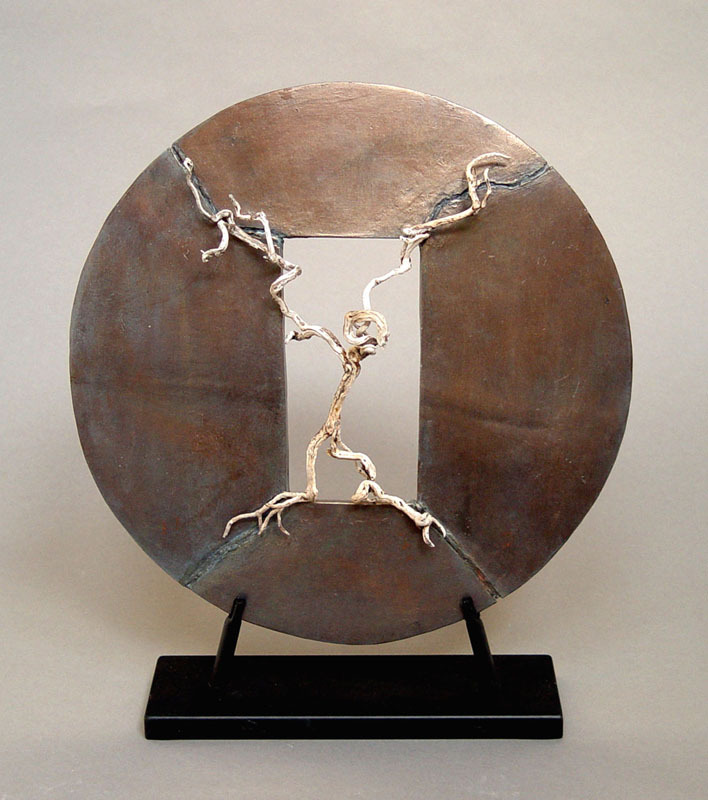 Human relationships are the subject of the ceramic sculpture offered for this show by Pat Gilmartin. Narrative vignettes comprised of small figures engaged in ambiguous interactions encourage viewers to find their own meanings in the scenes. The figures, in pairs and trios, are combined with found materials, often rusty iron shapes. In juxtaposing the smooth, malleable clay with the hard, corroded surfaces and colors of the metal, Pat heightens the tension that exists among the figures. Liisa Salosaari Jasinski was born in Finland but has lived in the U.S. for many years. The clean, modern style of Finnish design, as well as early 20th century European Expressionism, inform her work as a visual artist. In the current show her work consists of multi-media paintings and constructions. Their varied elements include linen, foils, steel wool, gels, paints, and transfer images – all mingled through physical processes of stamping, painting, stenciling, and gluing to create complex, relief-like surfaces. 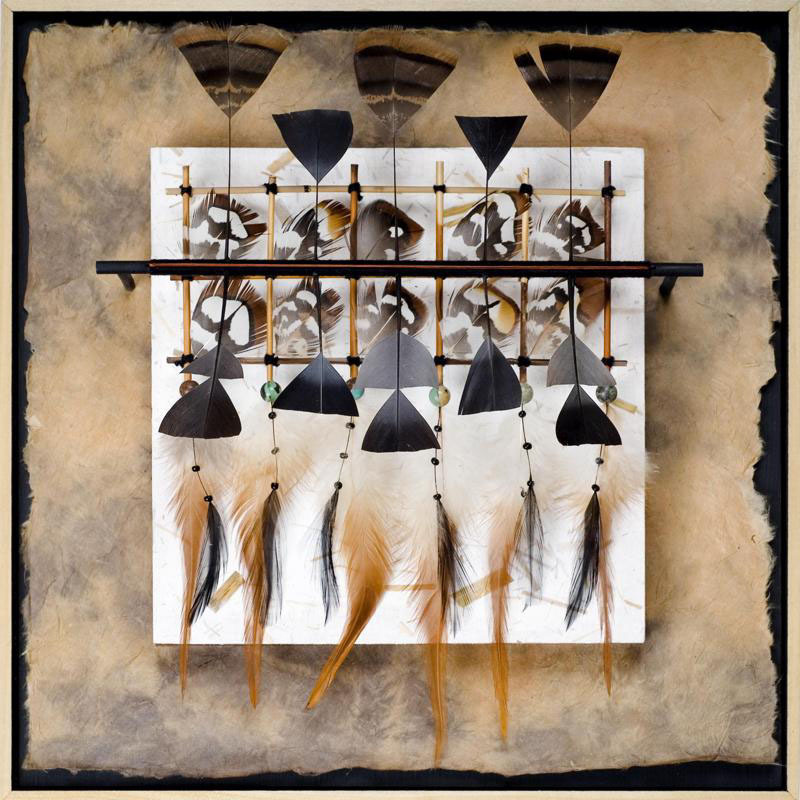 George Down, whose work is currently represented by galleries in Santa Fe, NM, and Cheyenne, WY, presents his unique constructions made from natural materials for the first time in Columbia. Using simple components found in nature – feathers, pine cones, stick, twigs, stones, shells, tree bark – Down weaves these elements into three dimensional compositions and subsequent narratives based on the graphic textures of nature. 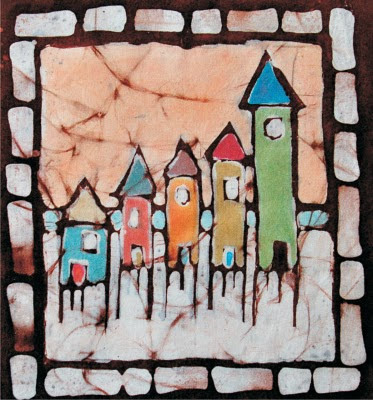 Columbia artist Eileen Blyth is known for her paintings and assemblages. She creates constructions of found objects combined with paint and fit together as if in conversation. She is attracted to objects by their textures, colors, or surfaces, and likes to imagine how they got to be in the places where she found them. As well, the objects’ conditions, how they are continually shaped by each passing car or change of weather, interests her. 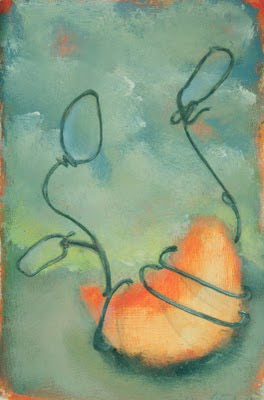 Sometimes the shapes and imagined conversations work their way into other paintings and drawings. As she says, “The evolving shape, the repeated motion, the sense of metal scraping road; it all plays into the work.” Eileen has a new studio in the Arcade Art Studios on Main Street in Columbia. Hours: Opening reception Thursday, Jan. 27, 5-8 p.m.